The trek to Gokyo provides an excellent opportunity to see an eyeful view of the Mt. Everest at close range. 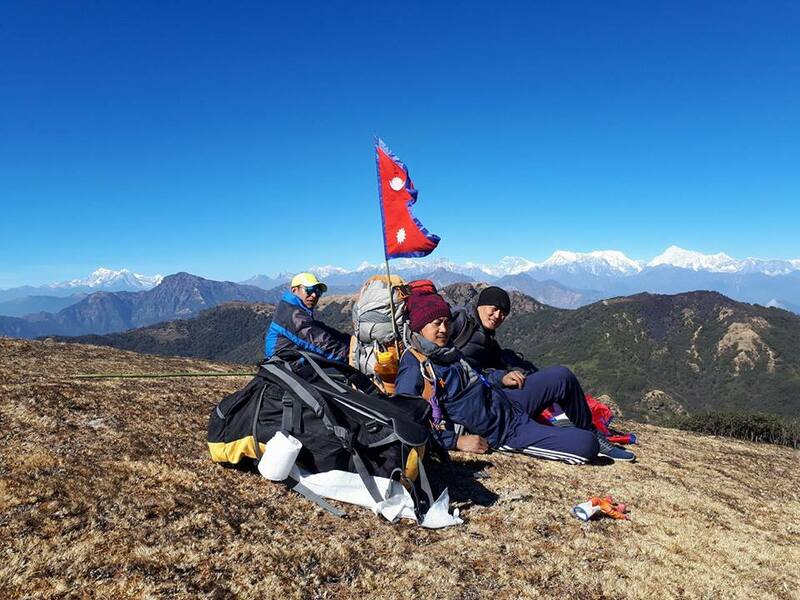 This trek is to be considered as an alternative trek to the traditional Everest Base Camp trek that offers magnificent view of the mountain peaks and the Ngozumpa Glacier- the largest in the Nepal Himalayas. The image of this region is associated with the soaring view of the most popular mountains view of Nepal like Mt. Cho-Oyo (8153m), Mt. Everest (8848m), Mt. Lhotse (8501m), Makalu (8463m) etc. which are clearly visible from Gokyo Ri (5483m.) above Gokyo Lake. 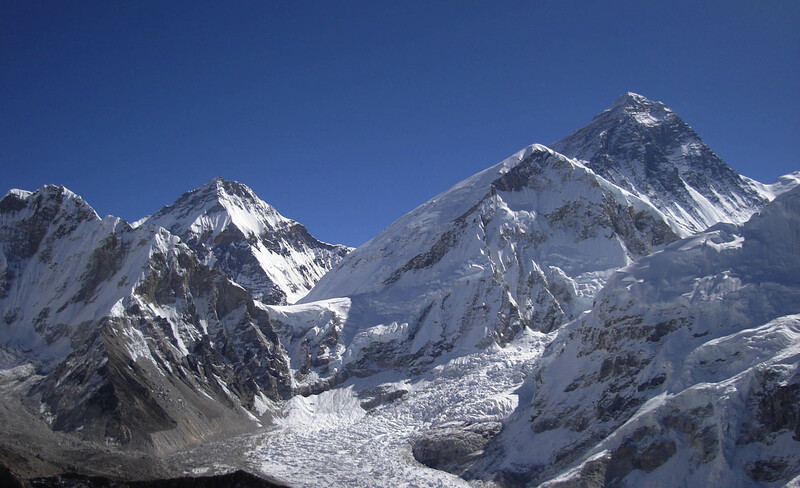 One of the most remarkable features of the trek is the view of tremendous ice ridge between Cho Oyu and Gyachung (2922m) located in Khumbu region.This extraordinary trek is also worthy in a sense that it offers an ample opportunity to explore the amazing destination and its impressive sight, which is beyond human imagination. Day 1: Arrival in Kathmandu airport (1345 meters). There you will be met by our Airport Representative and transferred to hotel by private tourist vehicle. Overnight at hotel with breakfast included. Day 2: Sightseeing around Kathmandu valley. Your sightseeing trip will start at 9AM in the morning after breakfast. 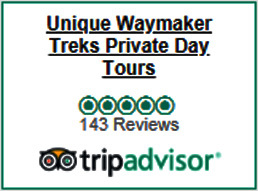 We will provide a private vehicle and professional tour guide. We visit Pasupatinath temple, Buddhanath, Monkey temple, Bhaktpur durbar square and Kathmandu durbar square. The afternoon includes a final briefing and preparations for the trek. Overnight at hotel with breakfast included. Day 3: Fly to Lukla (2804 meters) trek to Phakding (2610 meters) 3 hours. An early morning start takes us to Tribhuwan International Airport in Kathmandu for the 35 minute scenic flight to Lukla at 2804meters. On arrival at the airport guide will brief you and introduce our porters before we begin our trek towards Phakding at 2610meters. Overnight at Guesthouse with breakfast, lunch and dinner included with hot drinks. Day 4: Trek to Namche Bazaar (3441 meters) 5.30 hours. Namche Bazaar known as the Gateway to Everest, there are many good hotels and lodges here, along the whole Everest trail this is quite a big village. Overnight at Guesthouse with breakfast, lunch and dinner included with hot drinks. Day 5: Namche Bazaar Acclimatization day. We will spend a day here in order to acclimatize and adjust to the thinning of the air. A short trek to a museum celebrating the traditional customs of the Sherpa people. Today we hike up the Syangboche Airport, and around Everest View Hotel. From this point, we have rewarding views of the Himalayas with a stunning sunrise or sunset over the panorama of the Khumbu peaks. Overnight at Guesthouse with breakfast, lunch and dinner included with hot drinks. Day 6: Trek to Phorste Thanga (3680 meters) 5 hours. Today, the trail climbs steeply out of valley through rhododendron forest, juniper and large conifers start to appear as the elevation increases making trekking beautiful in spring. The trail passes through Yak Kharkas and summer settlements. The views of Khumbi La and Tawache are magnificent throughout the day. Overnight at Guesthouse with breakfast, lunch and dinner included with hot drinks. Day 7: Trek to Machherma (4470 meters) 5 hours. The trail climbs a ridge for an excellent view both down the valley to Kengtega and up towards Cho Oyu and descend to a river and again climbs steep to the terminal moraine of the Ngozumpz glacier. We will reach at Machherma by early noon. Overnight at Guesthouse with breakfast, lunch and dinner included with hot drinks. Day 8: Trek to Gokyo (4790 meters) 5.30 hours. Today the trek takes us at one of our final destination, Gokyo (4790m). We will make this camp our base for 3 nights as we will have couple of sightseeing trips around Gokyo. Overnight at Guesthouse with breakfast, lunch and dinner included with hot drinks. Day 9: Trek to Gokyo Ri (5483 meters) and then Back to Gokyo 5 hours. Today, early in the morning we have steep climb up to the top of Gokyo Ri at elevation of 5483 meters, ample rewards to anyone that attempts this trip. There are stunning views of the supper Gokyo valley, the massive Ngozumpa Glacier and an incredible panoramic view of the whole Khumbu Himalayas, such as giants as Everest, Lhotse, Nuptse, Makalu, Cho-Oyu and Gychung Kang can be seen. Those who explore the glacier and Gokyo peak are rewarded. This day we have for acclimatization and after noon back to the camp. Overnight at Guesthouse with breakfast, lunch and dinner included with hot drinks. Day 10: Trek to Dole (4200 meters) 6 hours. Following same trail down, we will make our descent to Dole. Overnight at Guesthouse with breakfast, lunch and dinner included with hot drinks. Day 11: Trek to Namche Bazaar via Khumjung village (3780 meters). 5 hours. Descend to Namche Bazaar via typical Sherpa village of Khumjung . Leaving the mountains behind us our descent continues back to the town of Namche Bazaar at elevation of 3441meters. Overnight at Guesthouse with breakfast, lunch and dinner included with hot drinks. Day 12: Trek to Lukla (2804 meters) 6 hours. Finally we return to Lukla where the trek began, which seems a lifetime ago. Enjoying time to reflect on the trek as a group and the personal achievement of all those who took part. Overnight at Guesthouse with breakfast, lunch and dinner included with hot drinks. Day 13: Morning flight to Kathmandu from Lukla. An early morning 35 minute scenic flight back to Kathmandu provides time to reflect upon the mountains you have recently visited for one last time. Overnight at hotel with breakfast included. Day 14: Leisure day in Kathmandu. It’s also spare day in case of bad weather in Lukla, If you are interested in continuing on to the Chitwan Jungle Safari, River Rafting Adventure or any other tours you can start today. Day 15: Transfer for your final flight departure. The trip ends, our Airport Representative will drop you to the Kathmandu international airport for your flight departure from Nepal.